Born in 1845, Jenny, the future Mother Cécile Bruyère, exhibited as a child those tendancies that can beset a soul of immense talent and sensitivity: pride, stubbornness, and aloofness. At the age of eleven, providential circumstances brought her under the spiritual tutelage of Dom Prosper Guéranger, abbot of Saint-Pierre of Solesmes, whose work of revival of the litrugical life of the Church and, in particular, of Benedictine life in France, is legendary. Planted in the riche soil cultivated so expertly and prudently by dom Guéranger, she would blossom and become the instrument through wich "the consolation of his latter years" would come about: the Benedictine abbey of Sainte-Cécile of Solesmes. 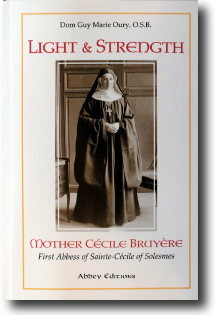 As its first abbess, Mother Cécile herself, in her hidden contemplative life, eventually formed and guided souls with repercussions well beyond her monastery walls and the boudaries of France, thus furthering the spiritual edifice hers saintly mentor had established. This multi-faceted biographical work is at once a fascinating historical chronicle tracing the triumphs and vicissitudes of religious life in post-Revolutionary France, a spiritual guide in bringing to light the interior life of a great woman of God and her teachings as a religious superior, and a revealing analysis of a little known dimension of Dom Guéranger's life and work.